Tocqueville was not only an active participant in the French Revolution of 1848, he was also a deeply perceptive observer with a detached attitude of mind. He saw the pitfalls of the course his country was taking more clearly than any of his contemporaries, including Karl Marx. 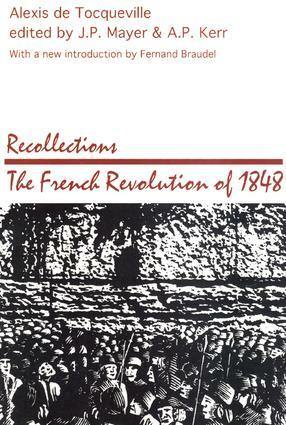 Recollections was first written for self-clarification. It is both an exciting, candid, behind-the-scenes account of what actually happened during those tumultuous months and a remarkably shrewd analysis that has become an accurate forecast of future societies wrestling with the dilemma of synthesizing equality and freedom. Thus the book has a relevance that extends beyond France, to our own country and others, a relevance that is explored in J.P. Mayer's new introduction.Out of print in English for several years, Recollections is presented here in a translation based on the definitive French edition of 1964. It captures the wit and subtlety of mind that have made this book one of the most popular of all Tocqueville's works. Tocqueville's own comments, which he wrote into the manuscript, including his variants, are given, and the editors have added explanatory notes.